Jennifer Smith, news editor for the Dorchester Reporter, says community newspapers act as a local voice, raising issues that may not be covered by larger media and can create stronger engagement with their audience because they are closer to their readers. Smith spoke at “Pizza, Press & Politics” at Northeastern University’s School of Journalism last week about the paper’s role at a small, local paper within the larger Boston news ecosystem. Even though the Reporter – a community newspaper reporting news, opinion, and information about Dorchester, Boston’s largest neighborhood by population – operates with a small team of reporters, a close proximity and strong connection with the community allows them to cover local issues sooner and more extensively, she said. 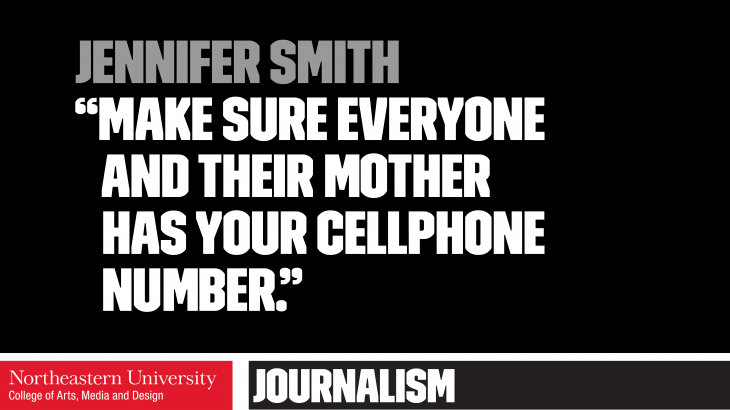 In an interview prior to “Pizza, Press & Politics,” Smith discussed how the Dorchester Reporter is making changes to adapt to the internet and social media age. The newspaper is also online, but without a paywall. Although their primary business model is print, the paper tries to capture readership from both print and online spheres by having their reporters’ and editors’ presence on social media. They reach out to audiences through live-tweeting and livestreaming events as they happen, and try to publish digestible online articles for readers on the go. Smith, a journalism major, graduated from Northeastern in 2015. She wrote for the university’s student-run newspaper, The Huntington News, and did a co-op at The Boston Globe. She encouraged students to take advantage of the more forgiving working environment at student-run newspapers, magazines or radio stations to explore the type of journalism they want to do before building real work experience and skills through co-op opportunities outside Northeastern. 1. Community news organizations can be a feeder of news stories to bigger news organizations. Get in the habit of finding out what your local news organizations are reporting and find opportunities to advance local-level issues to the city or even national level. 2. Find stories in unconventional sources. You will most likely find good stories just by talking to people at local civic meetings or reaching out to local groups leaders. 3. Understand the market you are serving. Think about what keeps your community up at night and approach the issue from an insider perspective. 4. Covering a vast and fast-changing community can be hard, but look for where changes are most likely to happen – around transits, near public facilities, etc.